The expulsion of more than 14 million Germans from Central and Eastern Europe during the years 1944-48 resulted in the deaths of some two million human beings, 473,013 killings are attested by eye-witnesses who were able to report the names of the victims. Obviously, his mass displacement of entire populations has consequences until today. And yet, it has been almost taboo for more than 65 years. These 50 Theses fill this gap by laying down the facts and explaining the main historical and international law implications. 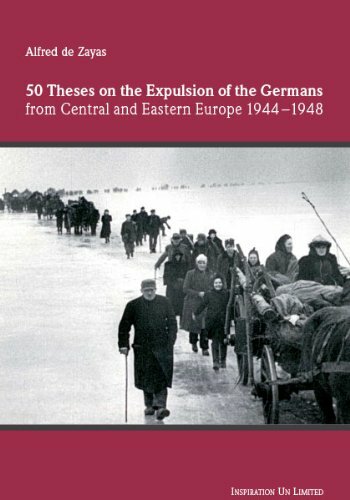 The original German version of the Theses, published in 2008, was well received with almost 9000 copies sold. This enlarged and updated English version gives a concise introduction to this dark chapter of history. Alfred de Zayas is an American lawyer and historian. He is Professor at the Geneva School of Diplomacy and has taught both international law and world history at universities in five states. For 22 years, he served as senior lawyer with the Office of the United Nations High Commissioner for Human Rights. In March 2012 the UNO appointed Prof. de Zayas as “Independent Expert on the Promotion of a democratic and equitable international order”.